We will have some Glazed Purple Stripes this year, mostly Celeste and some Purple Glazer. 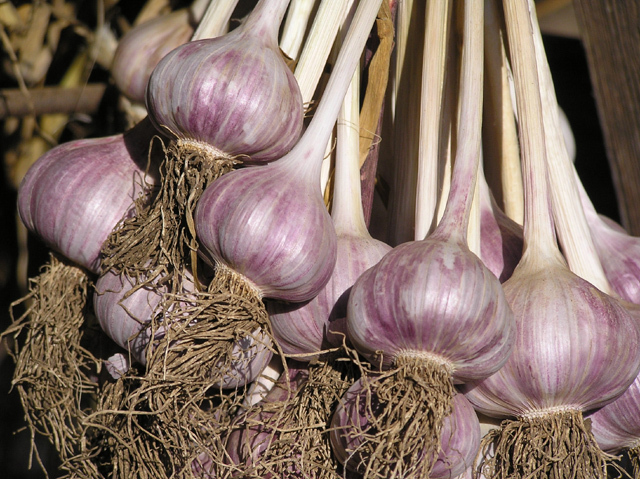 Other Glazed Purple Striped Garlics will likely be of limited availability this year. As we get them, such as Purple Glazer, Vekak or Red Rezan, etc., here is where we will list and describe them. Glazed Purple Stripe garlics are tall, willowy garlics that grow almost anywhere, except for the warmest of warm winter areas, and even there some years. They are vividly colored and have great eye appeal because of their deep vibrant colors and with their rich warm flavor, they taste as good as they look.